We all need support at times. There is often some part of our lives that isn't perfect or working as well as it could be. Usually we cope, but building resilience is important for all of us. Stress, lack of sleep, worries and concerns can weigh us down and erode our resilience. We need to acknowledge when we need help, and have social support networks to fall on when we need to talk and seek the advice and support we need. The Social Club provides social and health and wellness support for members and staff, but there are many other resources that are available. We've tried to collect and link to some of them here. If there is any advice or help you need, don't hesitate to contact the Social Club. We are a community based organisation and our goal is to connect and provide support, without judgement or prejudice. Did you know that fitness and staying active has a large part to play in resilience and positive mental health outcomes? See our Get Active resources for more info. Lifeline provides a phone crisis support service. We all hope never to need such a service, but many of us do at times. It's sometimes not easy being a dude. Mens Line Australia have a 24hr line. Black Dog provide expert advice and information on mood disorders like bipolar and depression. 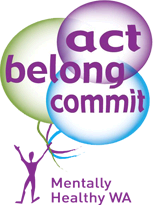 We're more positive and happy when we act, belong and commit. Why not join the Social Club, get involved with a social or sporting group and make a difference. Need help or info on drug and alcohol issues? adin is a good starting point. Info and support for diabetes - including prevention! Beyond Blue is about supporting the over 3 million Australian's suffering from depression and anxiety. The social club is a great way to build resilience with social and physical support. You can connect with others that understand your work-life, needs, and responsibilities. A burden shared is a burden halved.